Today I have TWO fun things to share! One is our Friendsgiving Girls Celebration and the next is a super delicious AND a HEALTHY Thanksgiving recipe that’s perfect to add to your Holiday rotation. 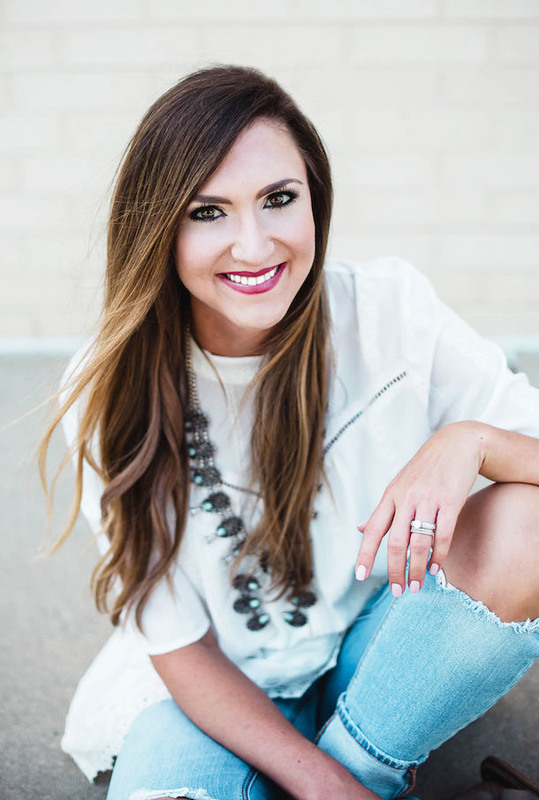 Keep reading to meet a few fun friends and, Lexie, who will be whipping up yummy recipes for you guys through Christmas! 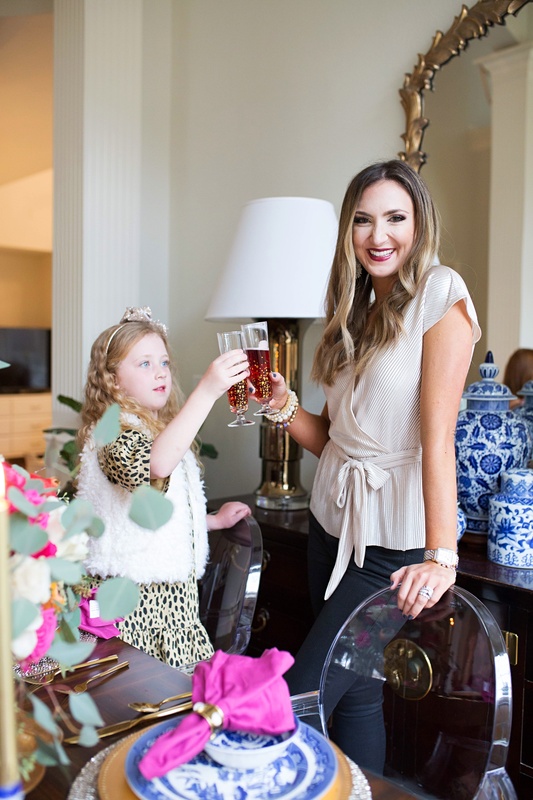 A few weeks ago, my sweet friend Tara of Jimmy Choos and Tennis Shoes and her darling daughter Olivia joined Landry and I in Dallas for a fun Mother + Daughter Friendsgiving dinner in Dallas. Tara is part of the #GibsonXGlam Collection with me and while it was fun working with her on this, I’ve had the pleasure of knowing her for years through blogging. 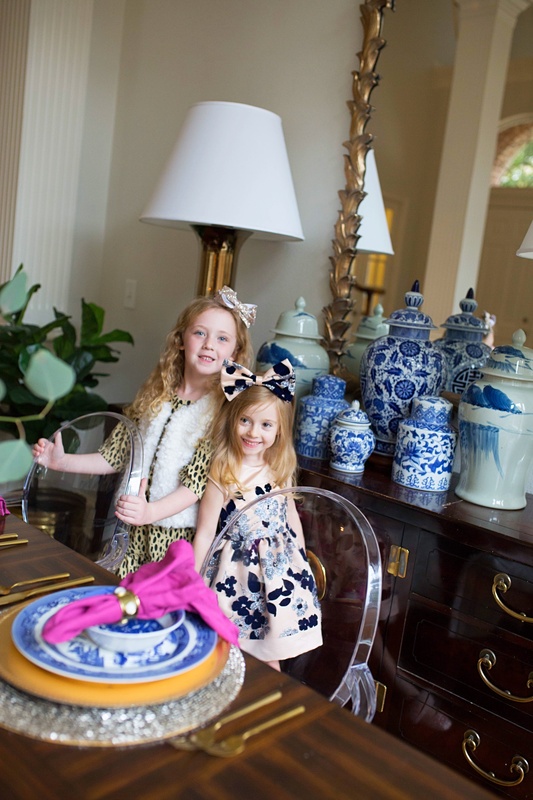 See how we styled our Glam tops for a fun Thanksgiving dinner with our little gals! 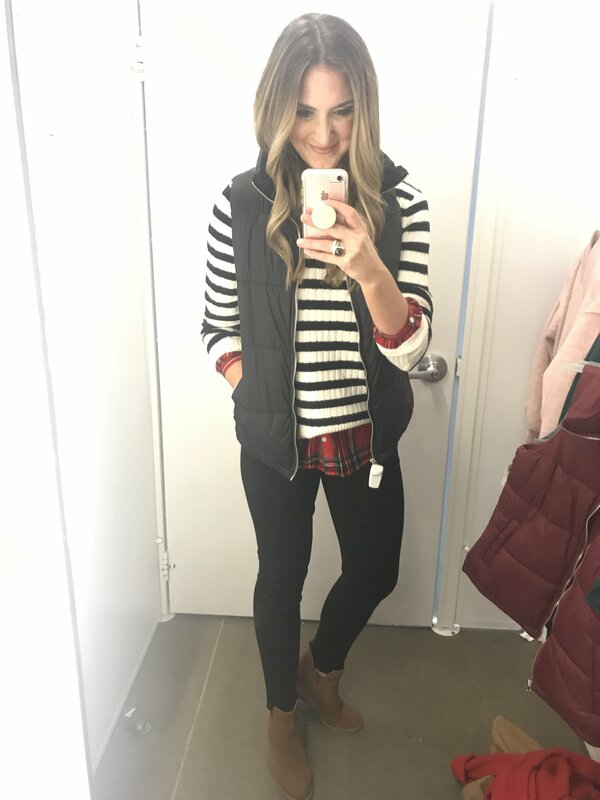 I truly love that the Gibson X Glam tops can be dressed up or down and really carry you through the entire Holiday season, starting with Thanksgiving! Tara’s top is a beautiful blush velvet with adjustable ties at the shoulder. 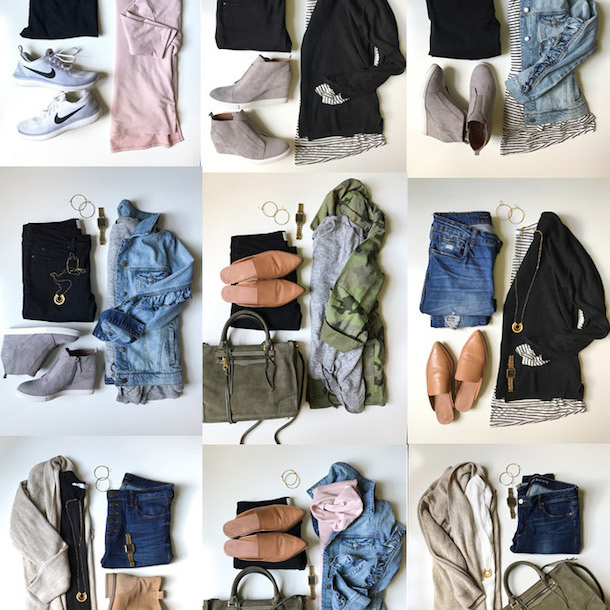 It’s easily dressed up with a cute skirt or made more casual with your favorite pair of distressed jeans. 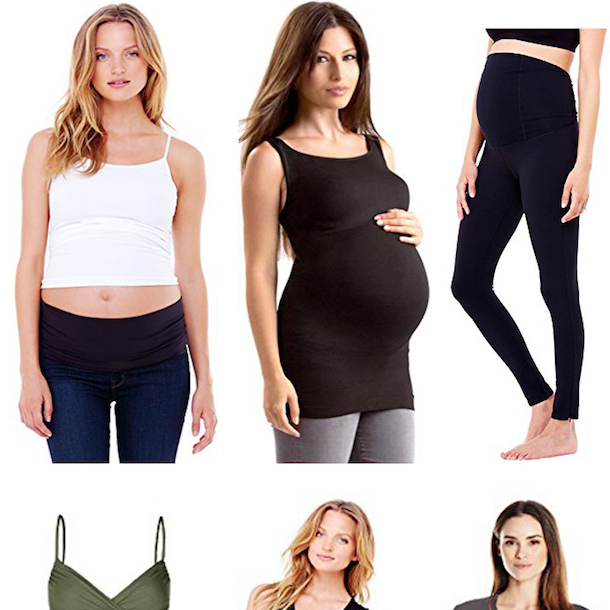 The top that I’m wearing is not only flattering and easy to wear, but it’s also nursing friendly and under $50! 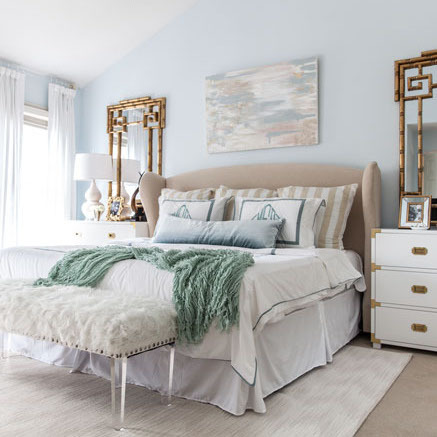 The shimmery champagne color is beautiful and so festive. See the entire Gibson X Glam Collection HERE! These girls were so precious together. They chatted all things American Girl, made crafts and joined us in a toast with sparkling grape juice! 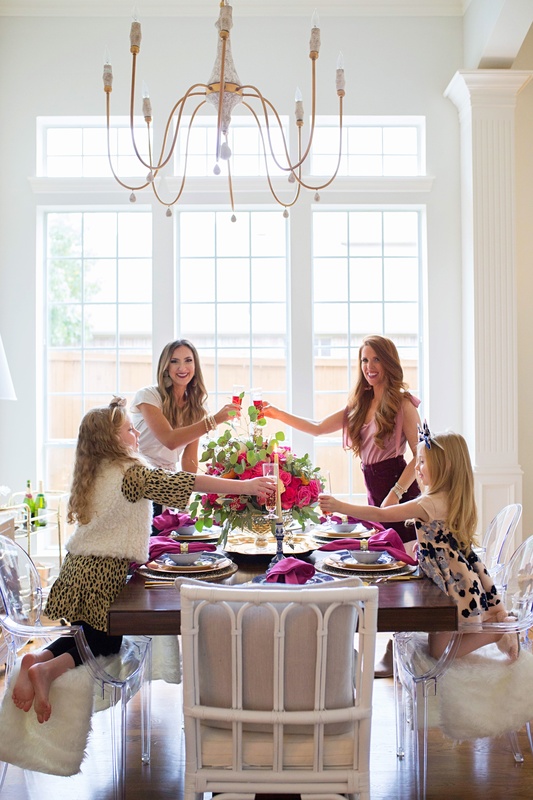 If you’re looking for a fun way to show your girlfriends and their littles just how thankful that you are for their friendship–this Friendsgiving was so much fun to put together. 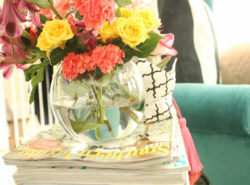 See more about this tablescape + an easy DIY for this floral arrangement in THIS POST. Hey y’all! 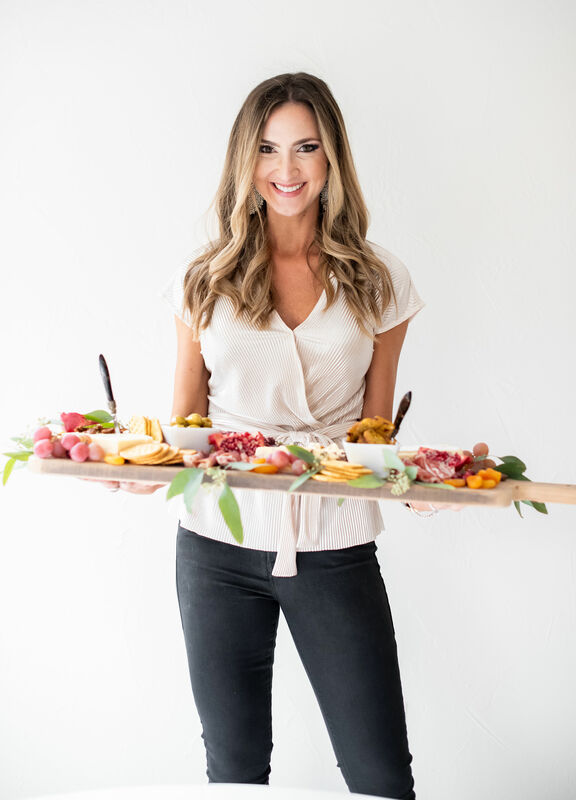 I’m Lexie from A Slice of Sweet and I am SO excited to be sharing one of my favorite healthy Thanksgiving side dishes on Style Your Senses today! I know there are a lot of you that are #TeamChristmas starting November 1st, but I feel like I’m cheating on Thanksgiving by pulling out the garland and stockings after Halloween! Anyone else?! 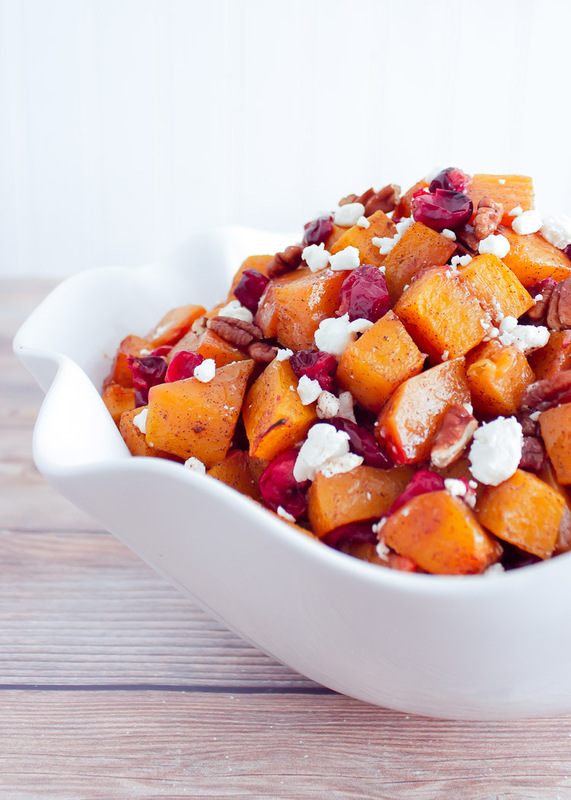 Well, even if you’ve already decked the halls and are over Thanksgiving, this delicious, sweet and savory Cranberry & Butternut Squash dish is totally acceptable to make for both holidays. PS be sure to save the Pin at the bottom of the post to your Pinterest to pull out when you’re ready to make it! Hydrate, hydrate, hydrate! You’ll likely be consuming whole lotta sodium and alcohol, and it’s so easy to forget to hydrate amidst the chaos and food. So if you don’t have one, buy a cute reusable water bottle and carry it with you. Then make it a goal to refill it “X” number of times per day! 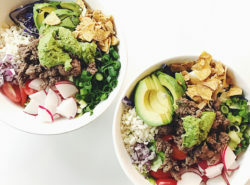 I promise you will feel less hungry and bloated… you can thank me later. Put it on a plate! With all the food and snacks around, it’s easy to graze 24/7, but if you put it on a plate, you will be much more mindful of how much you are eating. Don’t skip a meal! It’s easy to want to skip breakfast and lunch so you can save up for your big holiday meal, but that will only lead to overeating and feeling miserable later. Try eating smaller meals instead of skipping them completely. 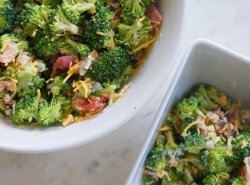 Meal prep my paleo breakfast skillet ahead of time so you’ll have something healthy to tide you over until your big meal. Have a slice! YES, go ahead and have a slice of your mom’s pumpkin pie! It’s your absolute favorite and by golly, you deserve it. Denying yourself a certain food will only lead to overindulging later. So allow yourself to have a slice or a few bites, then walk away and focus on something else. Whether or not you’re a proponent of balance, this dish is the PERFECT addition to your Thanksgiving menu this year. The maple syrup and cinnamon bring out the sweet, nutty taste of the squash, and the cranberries and pecans are a great holiday touch. And the crumbled goat cheese… need I say more?! It takes this dish to a WHOLE. NEW. LEVEL. And BONUS… butternut squash is good for you! It’s high in vitamin A & C, fiber, potassium, and an abundance of carotenoids (shown to protect against heart disease). It’s also a complex carb, which means it releases energy to the body slower, maintaining your energy level over a longer period of time. 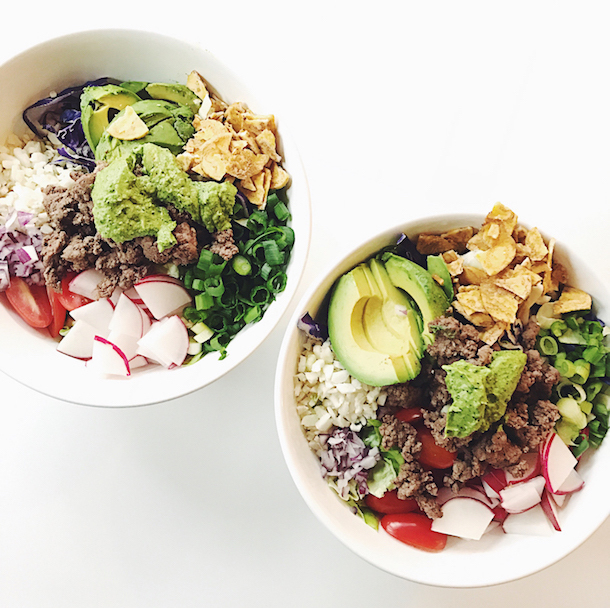 Delicious yet healthy is a total win-win in my book. If you’re interested in saving time, most grocery stores sell pre-cut butternut squash. If you want to save a buck, here is a great video on the easiest way to cut one (I always cut my own). If you are cutting your own squash, save time the day of your meal and cut it a day or two before and store in an airtight container in the fridge. This dish is best served warm but if the oven is too crowded, don’t sweat it! I’ve eaten this dish at room temperature and it is still DELICIOUS. I hope you have a wonderful Thanksgiving full of family, friends, and food! Be sure to tag Mallory and I on Instagram (@styleyoursenses and @asliceofsweet) if you make this dish! 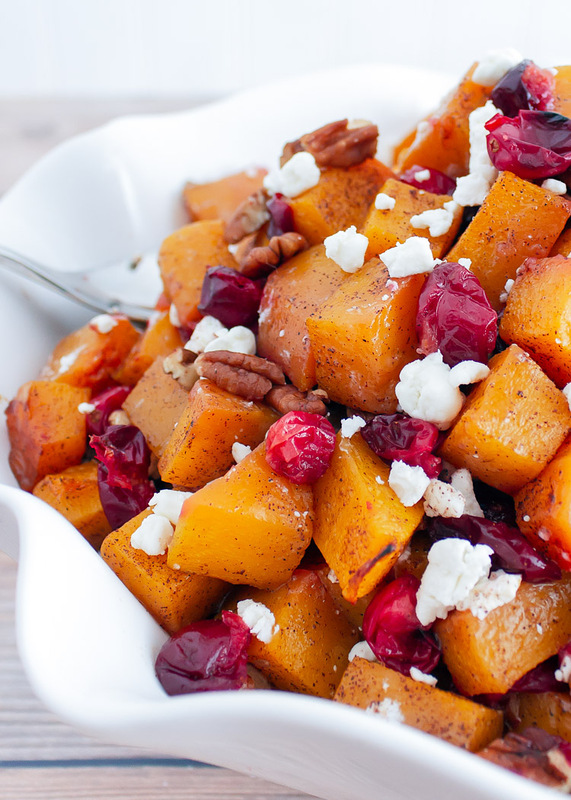 In a large bowl, add cubed butternut squash, olive oil, and maple syrup. Toss to combine. Sprinkle brown sugar, cinnamon, and salt over butternut squash and toss to coat evenly. 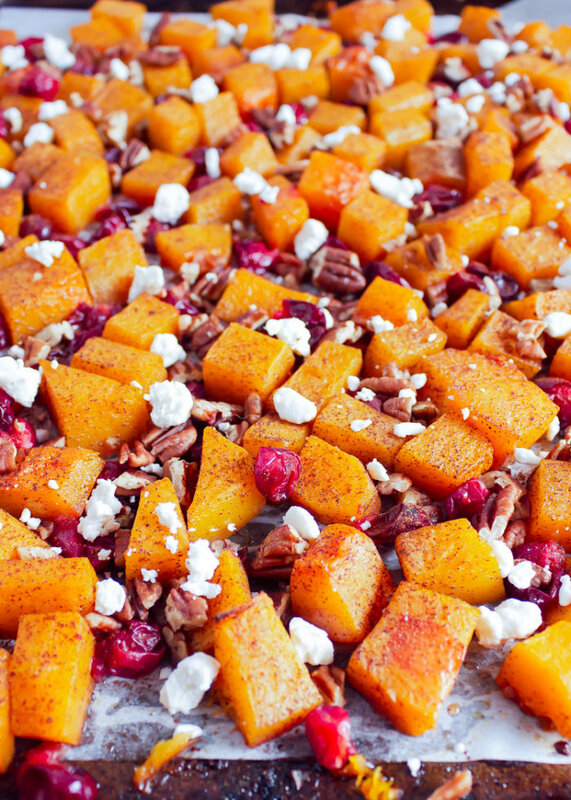 Spread butternut squash onto prepared baking sheet and bake for 25 minutes. Remove baking sheet from the oven and add fresh cranberries and chopped pecans. Stir around to combine with butternut squash. 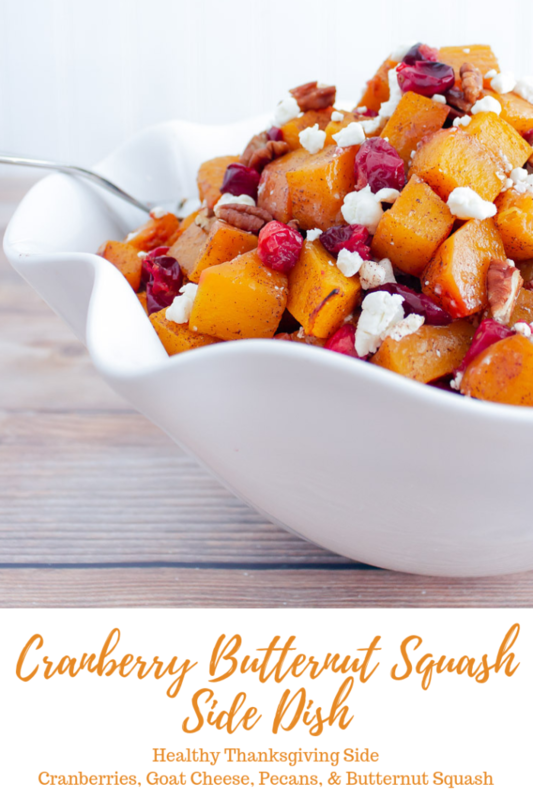 Place back in the oven and bake for another 10 to 15 minutes, or until cranberries soften and squash is fork-tender. Remove from oven and let cool slightly (about 10 minutes). Add to a serving dish and top with crumbled goat cheese. Yummmmmm!!! 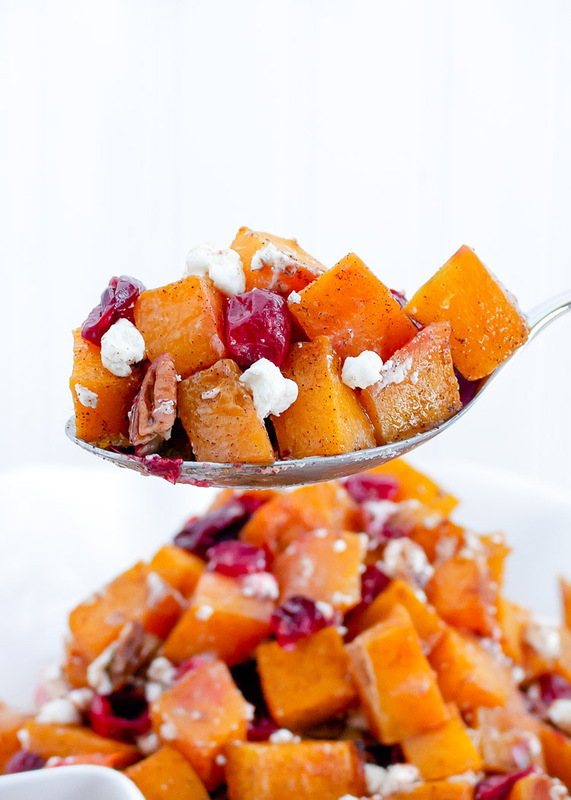 Pecans, goat cheese AND butternut squash all in one place— it’s so flavorful and delicious and will now be in my Holiday side dish rotation! Thank you so much, Lexie! You’re all looking great! This recipe looks yummy. Will definitely try. Thanks for sharing! I love the light fixture in your dining room. Would you mind sharing some info on it? Looks lovely. I bought the blouse you are wearing last week and I love it for the holidays! The same maker has a real pretty green satin blouse too which would be great for December.